It's a feastful day for Mega Fans. 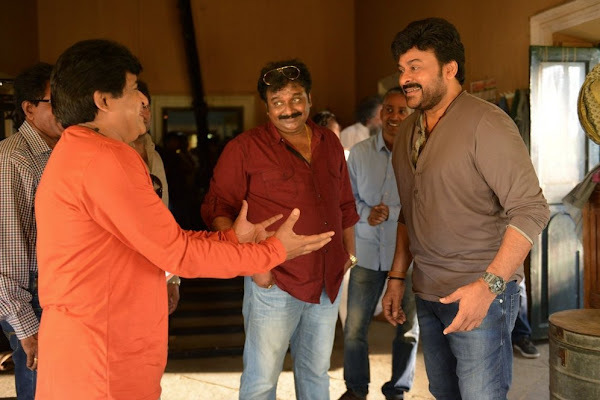 Finally, Mega Star Chiranjeevi's 150th film kick started it's regular shoot from today. Our Tagore star has joined the shoot on day 1. Unlimited energy levels chanted all over the shooting apot as Mega Star entered the location with make-up. VV Vinayak who delivered blockbuster hit 'Tagore' with Chiru is wielding the megaphone. Mega Power Star Ram Charan is producing this costly venture under Konidela Productions banner. On this Happy occasion, Director VV Vinayak said "Today, we kick started our film shoot. We are canning few entertainment scenes today with Mega Star and Ali . The first schedule will take place in around Hyderabad till 12th July. The film will make Mega fans happy and they will love his look in the film. Top actors and Top Technicians are working for this film. We will release the First look teaser very soon. I am very Happy that once again I got an opportunity to work with Mega Star after delivering super hit film 'Tagore'. As this film is Mega Star's 150th film, we are leaving no stone unturned. Chiru's character and this film will reach his fans expectations for sure. Comedy, Music, Fights, Sentiment and everything will be major highlight for this film. Movie is all about poor farmers and their struggles. The story came out very well and everyone appreciated it. Chiranjeevi garu and his family were excited after hearing the final output. We are very confident on the film and we hope audiences will like this film. We will announce the film title soon".